See more resort favorites here and here. Celebrities love McQueen. It's simply a fact at this point. And Sarah Burton keeps giving celebrities more reasons to don McQueen gowns for all their red carpet needs. 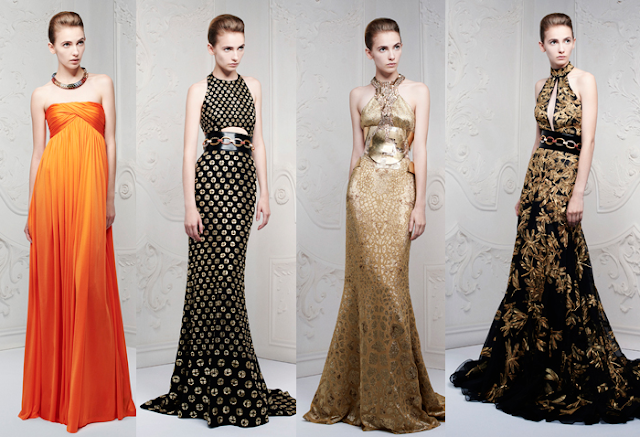 These four dresses from the Resort 2013 presentation all have such red carpet appeal. I bet the last dress (on the far right) will show up on a celeb within the next week. Rochas is usually one of my favorite collections because like myself, designer Marco Zanini seems to be completely in love with the fifties and sixties. The ankle-length pants, the ladylike accessories, the ruffled full skirts in delicate pastels- it all reminds me of bygone American summers. My love affair with all things retro continues with Moschino, which focused on psychedelic florals, oversized sunglasses, and exaggerated boxy shapes. On the top of my wishlist: that bell-sleeve jacket in dizzying lime. Carven is another favorite of mine, somewhat because I can actually afford some of their clothes, but this resort presentation made me so happy. 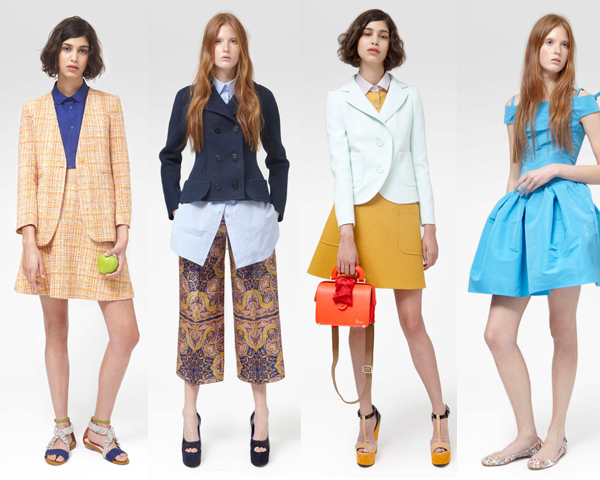 Carven is always good for a quirky take on the prep school girl, and this resort season was no exception. Tweed skirt suits, lunchbox-like purses, and intellectual brocade prints all had me smiling. And let's not even get me started on that bright blue beauty of a dress. Nicole Miller went for the literal denotation of the word "resort" with her collection. Crop tops, tie dye/ombre, and tropical prints were in full swing. My personal favorite: the navy-to-gold one-shoulder dress. The bodice is fantastically draped, the skirt wonderfully mystical. Matthew Williamson is not for the faint of heart. Williamson has always made a point of focusing on the girl who likes to stand out. He's a huge fan of beads, feathers, and other embellishments, not to mention dazzling brights. 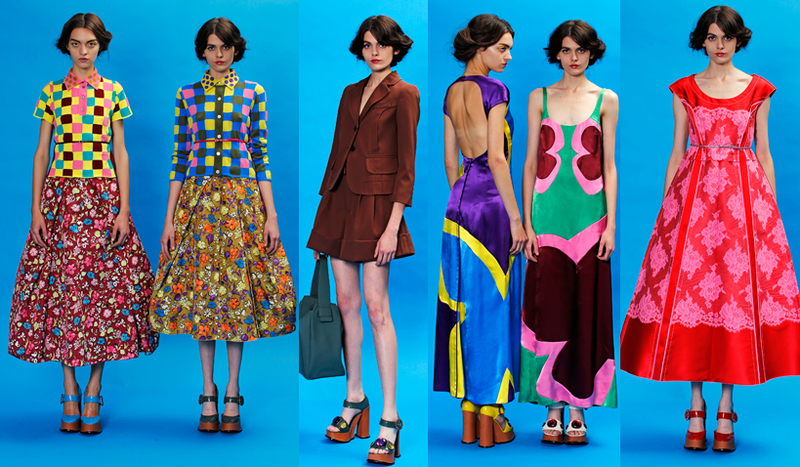 For resort, Williamson has enough color to satisfy a rainbow- bold corals, fresh mints, soft lavenders, and cool blues. I'm a big fan of the lace button-downs, perfect go-tos to throw over your swimsuit when resorting in Bora Bora. Another designer who isn't afraid of bold creations- Marc Jacobs. To quote Nicole Phelps' review on style.com, "Not for team MJ is Resort a season for play-it-safe clothes." In perhaps the most whimsical show of the season, Jacobs looked to the clown for inspiration and went from there. Part of Jacobs' genius is that some outfits are so editorial-ready, while others are perfect red carpet looks (Hilary Swank has already sported a black-and-white version of the pink-and-red dress on the far right), and others still are wonderful retail pieces (see the brown short suit that I absolutely love). There's something in here for everyone. As usual, Jacobs mixes vintage looks (the mix-and-match prints and ankle-length skirts) with refreshingly modern outfits (see here). P.S. Elle Fanning better wear this dress soon or else. It was practically made for her! Love the orange McQueen Dress. I wonder if I could get them to make if for me in white. I want something fabulous yet simple for my beach wedding next year. I actually think I've seen a very similar dress on net-a-porter. I don't know if it's McQueen but it's really pretty!